COBB Tuning Alpha Intercooler System PORSCHE - Pann Auto Performance - San Diego largest aftermarket automotive performance parts - What do you drive? AMS developed the Alpha Performance Porsche 991.2 Intercooler System to provide you the best cooling upgrade for your Porsche 991.2 Carrera. 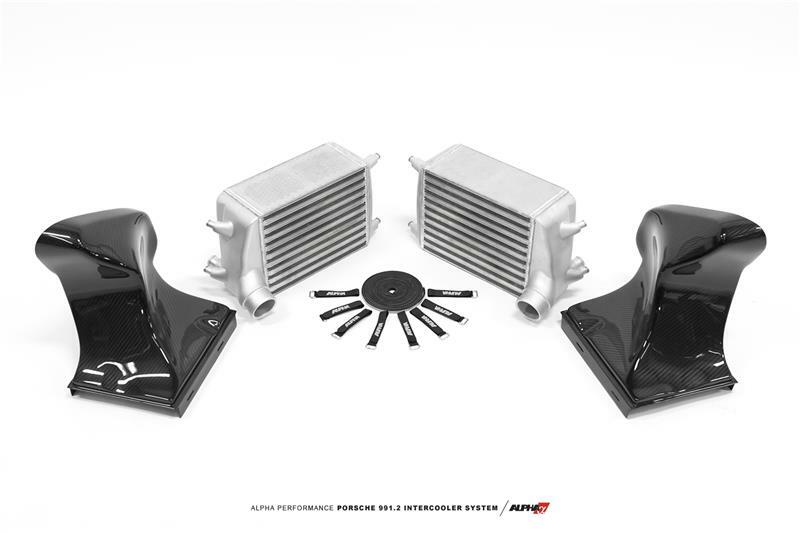 In bringing these intercoolers to market our goal was to provide the ultimate system in terms of quality, simplicity, fitment, aesthetic design, and performance.The Alpha 991.2 Intercooler System utilizes Garrett Intercooler cores that are 50% thicker than OEM! Alpha’s massive cores give you the most power producing intercooler upgrade on the market by way of significantly cooling the charged air flow. Each of the two super thick 120mm Garrett© cores provide an optimum fin density of 20 fins per inch for unmatched cooling. Channeling cool air to the intercoolers is vital for optimum performance of any intercooler. Some manufacturers choose to remove the factory intercooler inlets in order to cut costs. This greatly reduces the effectiveness of ANY intercooler whether it’s larger or not. Others require that you cut up and tape the factory shrouding to the intercooler core in an attempt to seal the shroud to the intercooler core. While this is better than removing the shroud, it is still not the most effective way to boost performance. The Alpha Performance Intercooler kit requires no drilling and no cutting. The Alpha 991.2 Intercooler System retains full use of the stock intercooler inlets forcing cool air into our larger, carbon fiber shrouds. Not only is this option more aesthetically pleasing, each rigid OEM-quality carbon fiber piece is made to seamlessly mate to the Alpha Intercoolers feeding them cooler ambient air more efficiently than the alternatives. Not to mention, eliminating the removal or destruction of your intercooler ducting. Included with the kit are velcro Alpha branded “speed straps” that hold the lower duct securely to the upper duct that will not deteriorate over time. Perhaps the best feature about this intercooler system is that it maintains cooling efficiency as more Alpha Performance power producing upgrades are developed for your Porsche 991.2. It improves the effectiveness of your other upgrades giving you maximum hp output potential. The Alpha Performance Porsche 991.2 Intercooler System utilizes a pair of 120mm thick high volume cores, smooth cast aluminum end tanks, and organically shaped carbon fiber ducts giving you the best cooling upgrade on the market. Each high quality Garrett core provides optimum fin density for unmatched cooling.